A: The vibrant 1280x800 HD display loaded on the Google’s 7-inch Nexus tablet does offer us a plenty sharp and crisp video watching experience. For YouTube buffs, no 3G or LTE on this tablet seems to be a fatal weakness. To be specific, only if you have a smooth WiFi connection can you play YouTube video on Nexus 7. But chances you are offline or suffer from intermittent network are really big. So you resort to download YouTube video to Google Nexus 7 in advance to solve the problem. However, in spite of going everything legal you still hit the iceberg. YouTube FLV videos cannot be played on Nexus 7 which only understands a few video formats like MPEG4, H.263, and H.264. How to fix the issue? 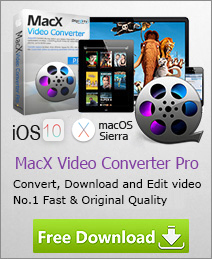 Calm down, MacX Video Converter Pro comes to save your life and helps you directly download video from YouTube and convert to Nexus 7 acceptable format at fast speed. The built-in technology Advanced De-interlace Accelerator, High Quality Engine and Intelligent A/V Synchronizer stuffed in this YouTube to nexus 7 converter tool are icing on the cake, endowing the converted video with crisp image and superb sound effect. If you are curious about how to finish YouTube to nexus 7 downloading and conversion, keep reading on. Free download this YouTube to nexus 7 converter on Mac OS, click "YouTube" button, add the YouTube video URL to the address bar. After you click "OK", the rest video downloading job will be automatically done by this YouTube video downloader. When entering main interface of this Mac video converter, you are allowed to select Nexus 7 recognizable video formats mentioned above like H.264, MP4, M4V, MOV, etc, choose output format you desire say MP4. Tips: To ensure a flawless playback on the marvelous on-the-go video player, you can make detail settings for output audio and video. For example, you are suggested to choose video codec, quality, bit rate, video frame rate, video size ( 1280 x 800),audio codec(AAC) audio sample rate, etc. After finishing the above steps, hit the "Start" button to start to download and save YouTube video in Nexus 7 recognized format. Then you can transfer YouTube video to Nexus 7 for unlimited playback. This Mac video converter software goes the extra mile for Nexus 7 users, helping to convert AVI, WMV, MTS, AVCHD videos to Nexus 7 compatible format. What’s more, it also versed in converting video to HTC One, Galaxy S9/S8/S7/S6/Edge, iPhone, iPad, iPod, etc with optimal quality. Thrilled for the Samsung Galaxy Note 8.0? Wanna download YouTube video to Samsung Galaxy Note 8.0 for watching at any time? This article introduces you MacX Video Converter Pro, helping you download and play YouTube video on Samsung Galaxy Note 8.0 with great ease. This article shares the best YouTube converter for Mac that lets you download YouTube video to Nexus 7, Galaxy S3, iPhone, iPad, iPod, iTunes or transfer YouTube videos to pretty much any formats like MP4, MOV, AVI, MP3, etc.